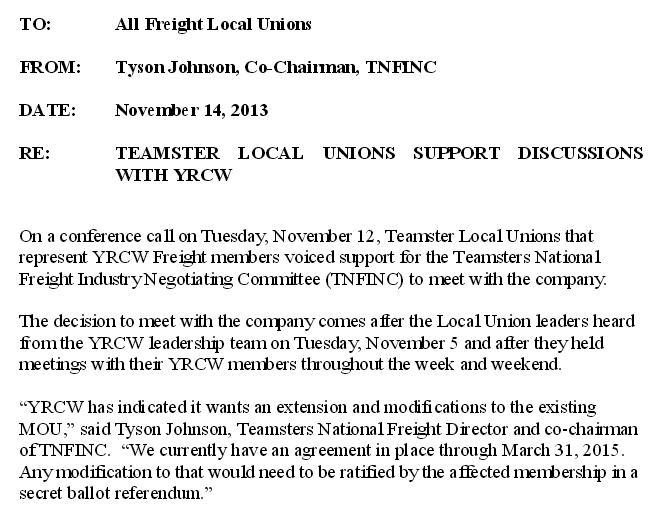 YRC YRC Worldwide CFO: No Teamsters Deal This Week! First they're in a hurry, so they have a last Tuesday conference call and claim "we understand that local unions have indicated support for TNFINC to begin discussions about the company's financial future". Now the YRCW CFO says no deal by the 15th? WTF! How long does it take for Tyson and the company to throw together a tentative agreement and present it to the membership for a quick vote before the end of the month? There shouldn't be any long drawn-out negotiations IF all they are asking for is to extend the current contract for 5 years from ratification. My guess is they're after a lot more than that under the heading of "and achieve cost savings for YRC Freight, Holland, Reddaway, and New Penn"! Stay tuned! I suspect that until a written proposal from YRCW is offered we will have to depend on truck driver rumors.
" we don't need no stinking rumors!" I am still trying to figure out if it is an extension of the current contract, or, a renegotiation for a new five year contract? For those who are able calm down. The stuff is going to get DEEP enough! Still no details????? What are they waiting for???????? Why not just merge everyone under one roof ! No thanks there Lizzard. I'll take my chances at Holland. You guys will fall for anything. No limit. Later, hurray! A tentative aggreement was reached. Sell for a quick 20%+ . And more "concern from creditors"
Extend whatever scam is in play. Why can't you people catch on to this scam? Theyve ran this scam for 5 years. I heard from a very reliable source out of the West that the company wants another 150 million in concessions. What the exact terms would be? I don't know. I was told the IBT told the company that they won't even bring that proposal to the members and to come back with a new offer. I was also told the company wants to sit down with the Union and re-negotiate the entire CBA. Stay tuned and stand firm. If your Local is keeping you in the dark then its time to take a drive to your Local with as many men and woman you can and go knock down the door of your BA's office and DEMAND answers. This is not the time to sit on the sidelines and watch from a far. GET INVOLVED! TOGETHER WE BARGAIN, DIVIDED WE BEG! Like I said before on TB, when you re-open the contract EVERYTHING is on the table! Would like to call it the NMFA but, now days its more appropriate to call it a CBA. Now it's called the BOA. Not that many Teamster jobs left to be the "Master" of.